Unless you are over 40, please do not tell me how magically wonderful motherhood is. In about a week, I won’t be hiding it anymore. Not that I couldn’t hide it… I hid a 15 lb. watermelon for a while there that no one noticed. It’s not likely they would notice a 3 oz. peach. But for my mom’s sake, we’re letting the cat out of the bag on Easter. It’ll be nice to be able to talk about it without using a code. Mom can finally put up her little counter thing that we got her. 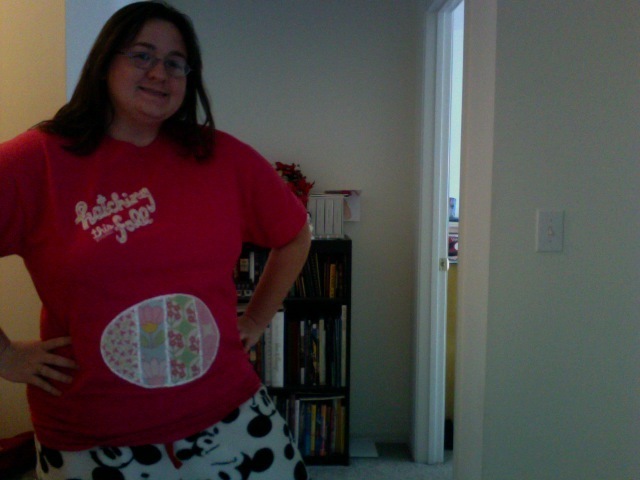 My plan is when people have cameras out and are all taking pictures I’m going to bust out in my Easter egg t-shirt. See who notices. I wonder if they’ll be surprised that we were able to keep it in for 14 weeks? 14 weeks. Wow. I thought the last two weeks of the first trimester would crawl, but the last week actually went by really quickly. (I guess Monday doesn’t count, because we were in VA, and it’s only Friday… so it has only been a few days.) I spent the majority of that time looking around at my messy house waiting for the nesting phase to kick in and make me want to clean like a maniac. I did clean the bathroom today. Baby steps. I spent $42 on all things yellow with giraffes (so friendly!) at the Lollipop (consignment) Shop in Charlottesville over the weekend. So, first thing this morning I threw it all in the washing machine, although I’m sure I’m doing that wrong and need to buy baby detergent. I was kind of taken aback by the fact that I am actually washing baby clothes. For… my baby. I still think based on my temperature charts that conception was here at home in Charlotte on 1/19, but since I’m sure the doctor is going to base it all on that ultrasound, I guess I should shift my due date to 10/7/12. Can’t lie, it’d be pretty neat to have it on 10/11/12. But anyway – WE SAW IT! It was a squirmy little maniac in there, kung fu fighting like a mofo. Pretty freaking cool. Ha. He’s a funny guy. Tom named it Mr. Happy. We said we needed a name for the precious critter that replaced Mr. Nasty. We’re not sure if it’s Mr. or Miss yet, so we’re going with Little for now. Little Happy.